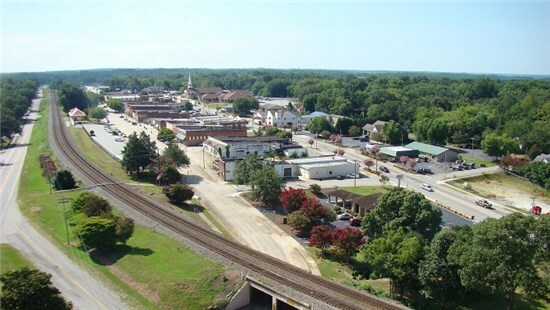 The City of Westminster, South Carolina is located in southwestern Oconee County, twelve miles from the Georgia - South Carolina border and is nestled in the foothills of the Appalachian Mountains. The residents of Westminster enjoy a high quality of life which is reflected in lower cost of living standards, affordable home prices, and proximity to many of the recreational amenities many people desire—such as the Appalachian Mountains and Lake Hartwell, Jocasse, and Keowee. Westminster was established in 1874 upon completion of the Atlanta - Richmond Railway. The community was known as Westminster as early as 1836 when records show that there was a Westminster School. Along with the railroad, a post office was established in June of 1874. The city was officially chartered on March 17, 1875. The surrounding area is mostly rural and historically agricultural in nature, although it has become more developed over the last decade. The City of Clemson and Clemson University are just 16 miles from Westminster, the City of Seneca is eight miles east, and the City of Greenville is roughly 45 miles to the east. Oconee County and Westminster have grown steadily during the past decade, spurred by the growth of the Appalachian Region along Interstate 85 which is now recognized nationally as a development “hot-spot. The I-85 corridor, running from Charlotte, NC to Atlanta, GA is one of the fastest growing regions in the United States. This corridor is characterized by strong economic growth, job creation, and low unemployment and a high quality of life. With a Mayor/City Council form of government, the City provides complete municipal services and utilities to its approximately 2,700 residents, with its public works, street & sanitation, recreation, police and fire departments. Home of the South Carolina Apple Festival.